The Great River Relay. Think of it as a 207-mile party with 12 best friends. Teams of 12 run along the world-famous Mississippi River as they rock out to live bands, enjoy the wacky participant costumes and antics, and make life-long friends with teammates and competitors. The party follows the Great River Road starting in La Crosse, Wisconsin and ends in St. Paul Minnesota. Each team member run at least three alternating legs ranging from 3 to 8 miles... and this is where the fun begins! 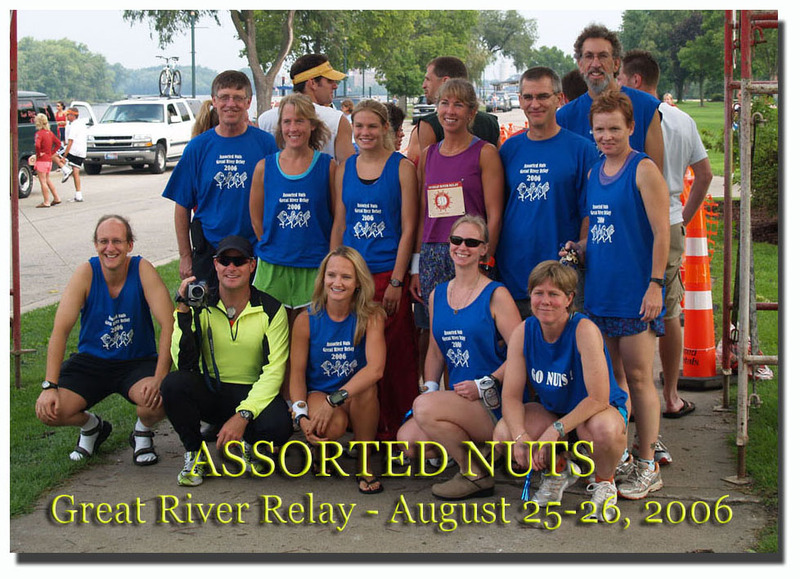 Assorted Nuts is the 12-person Minneapolis-based team that emerged to become one of 30 teams participating in the Great River Relay in August of 2006. Captained by Liz Harper, the team began their experience at approximately 10:00 am (Central Time) from LaCrosse, WI, August 25 and continued - non-stop at an 8:25/mile pace - into Saturday, August 26 where they reached the conclusion of their experience in St. Paul, MN, 207 miles away. But this is only the beginning of the story. It is this website that records their gauntlet and adventure in this inaugural August 2006 race known as the Great River Relay.